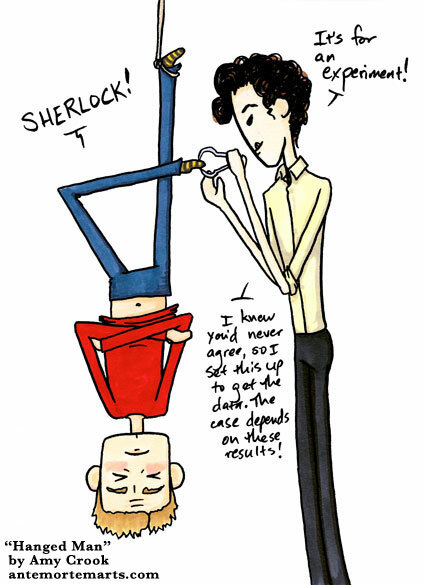 Sherlock needed some data about upside-down men, so he chose to trap his subject rather than asking. Sherlock: It’s for an experiment. Sherlock: I knew you’d never agree, so I set this up to get the data. The case depends on these results! Sherlock seems to think that “it’s an experiment” excuses all sorts of reprehensible behavior. 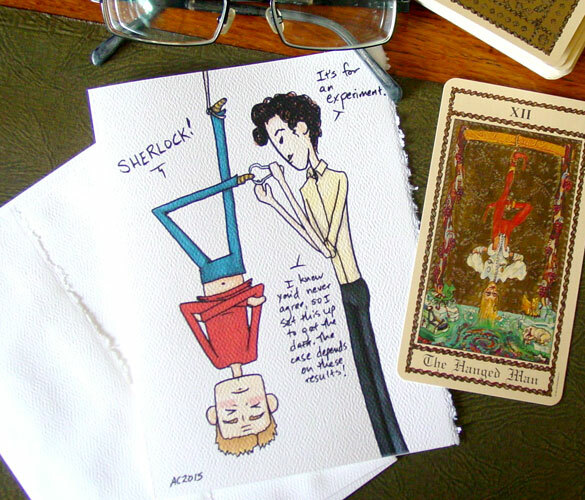 This little comic is also a parody of the Hanged Man card in the tarot deck, though John’s legs are backwards from the traditional layout, and of course there is not usually an irritating detective measuring toes. I did keep in the usual primary colors, but swapped them around, giving John a red shirt instead of trousers, and putting the yellow shirt onto Sherlock instead. You can send someone this delightfully weird comic on a card and make their day a little stranger, just buy one in my Etsy shop. Hanged Man, 5″x7″ pen & ink and Copic marker on paper.